There are countless third party launchers available on Android. So many, in fact, that I’m not sure how you can decide which is the best for you. I tend to find one, get it setup properly, and then stick with it for years on end because familiarity with a launcher is something that makes life with an Android device much easier. But then every so often a new player comes along that may end up causing me to consider a switch. That new player is called Blur, an app from the Klinkers, who are known for apps like Talon, EvolveSMS, and Sliding Messaging. Why Blur? What’s unique about it? Well, first off, Blur does most of the things that almost any other launcher can do. I’m talking about custom icon pack support, grid size changes, Android L styling, icon scaling, scroll effects, “OK, Google” hot word detection, resizing of all widgets, and more. It is by all means, fully featured. But it’s the new “Pages” idea that has been included that may make this a new launcher to truly consider. 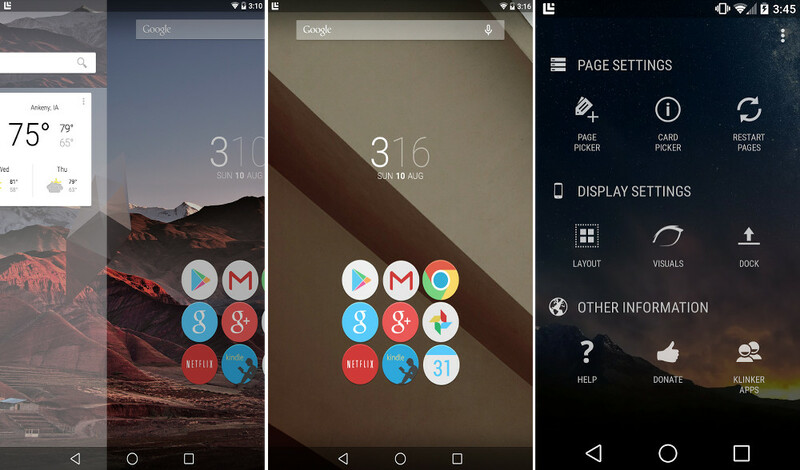 With Blur, the Klinkers have built upon the Google Now idea that we all love so much from the Google Now Launcher. With a swipe from the left side of your screen, you can access a series of “Pages,” which could be pages for your favorite apps. For example, the Klinkers have created a Page for their Talon app, bringing you a fully-featured Twitter experience that is just a swipe away from your home screen, yet doesn’t require that you load up the actual Talon app. They also have one for EvolveSMS, should you use it as your SMS app of choice. You can load up multiple pages of these, including one that mimics Google Now in a way. In theory, a couple of swipes from your main home screen could bring you all sorts of information from your favorite apps. They created an API for other developers to use to create pages of their own as well. We won’t know for some time if any other developers decide to build out Pages for Blur, and that may be the key to this app’s success. Pages make Blur have all sorts of potential, but if the only apps that can take advantage are those from the Klinkers, then is it really worth looking at? That’s a good question, which only time can answer. The app is completely free with no ads at this time. To get a better feel for how Pages work, check out the video below. Sunday Poll: Buying the Moto 360 if It's $250?